The HDX series clutch is an O.E. 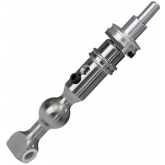 heavy duty replacement offering increased clamping load with Ram's 200 series organic woven clutch material and sprung hub dampening for stock like smooth engagement and up to 450 horsepower of holding power. Powergrip series clutches are the next step up featuring high clamp load and an organic/metallic friction blend for good driveability and a power holding capacity of 550 horsepower. Powergrip HD series clutches feature great clamping power and RAM's 900 series full metallic friction material. 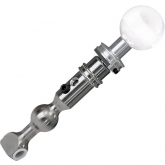 Designed for the ultimate in single disc holding power for competition and street use. Will be a bit grabby and harder to drive during street use but still streetable. Billet Steel Flywheel highly recommended. Power capacity up to 650 horsepower. 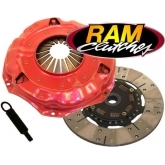 Street Dual Series clutches are RAM's dual disk setup featuring 2 clutch discs for high holding capacity but with friction materials chosen for great street driveability. 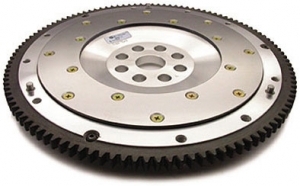 With a power capacity of up to 1000 horsepower this should be the last clutch you ever need. All Street Dual Series clutches include a matched billet aluminum flywheel.